Gail and her teenage daughter, Abby, are struggling to keep things stitched together. A terrible tragedy has struck their community resulting in, of all things, the high school prom being cancelled. For Gail’s dress shop this could be the end of their life as they know it. 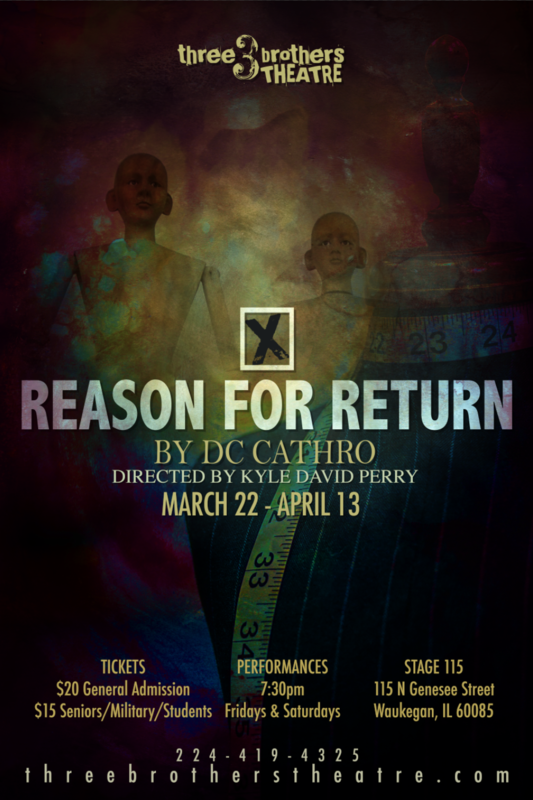 Reason for Return is a stunning portrait of AnyTown in America dealing with one of the most difficult issues of our generation. Kyle hails from Round Lake, IL where he studied both vocal performance and theatre at the College of Lake County. Acting credits there include The Tempest (Stephano), Young Frankenstein (Quartet/Ensemble), and Working (Lovin’ Al/Ensemble). He then transferred to the University of Wisconsin- Parkside where he earned a Bachelor of Theatre Arts degree. In his two years there he acted in several productions as well assistant directed three productions (including A Streetcar Named Desire) acted in several productions, finally directing a reading of Den of Thieves. The past three summers working with Kenosha’s Summer Shakespeare series: acting as Touchstone in As You Like It, directing A Midsummer Night’s Dream, and most recently directing Twelfth Night as part of Fleeing Artists Theatre’s premiere season. Most recently Kyle served as dramaturg on The Glass Menagerie and is currently in rehearsals for Almost, Maine both at Fleeing Artists. Kyle is excited to be working with Three Brothers Theatre for the first time!